Each of us will remember exactly where we were and what we were doing at the moment we heard about the Islamic Jihad attack against our nation on September 11th, just as our parents and grandparents always remembered the details of their lives on the day of the attack on Pearl Harbor. On that fateful day I was on my way to Washington, DC to participate in the Sudan Peace Act press conference to be held at the Rayburn House Office Building at 10:00 a.m. that morning. As usual on my drive from my Virginia office to my Washington, DC office, I was listening to WTOP which is a commercial all news radio station. Within two or three minutes of the first plane crashing into the World Trade Center, they had a live report from a traffic helicopter in New York City. Immediately I knew that the Islamic Jihad against the United States had reached a new level of terror. The media at first believed it was an accident, of course. I knew otherwise just because of the description of the damage. No small aircraft had hit the building and no large modern airliner would hit a skyscraper in broad daylight in good weather by accident. It was just after 9:30 when I got off the phone with the White House official and was passing the Pentagon on my way into Washington. 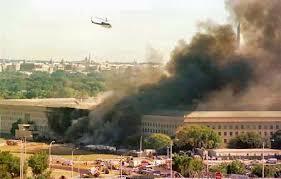 It was literally at that instant that American Airlines Flight 77 slammed into the south side of the Pentagon. I never saw the airplane hit, but literally felt the explosion rattle the windows of my Jeep. I can honestly say I did not know what had happened as I saw the smoke and flames rise from the Pentagon in my driver’s side outside mirror. I thought it must have been a truck bomb, since I was not willing to believe that Islamic madmen had managed to hijack more than two jets. The irony of my personal journey that day was the cancellation of the news conference on the Sudan Peace Act. That act was written for the sole purpose of stopping the slaughter of Christians in the Sudan by its Islamic government. During the Clinton Administration the Sudanese Muslims had been given a free hand at killing Christians as had the Islamic government of Indonesia. Clinton’s only foreign intervention to “save” a religious group was the bombing of Christian Yugoslavia. The destruction of Yugoslavia by Clinton led to the construction of terror bases in Europe for the first time. Without the Yugoslav army to intervene, terror cells were free to launch attacks against the West from Kosovo. Within days of the Jihad attack , the Bush Administration was proclaiming Islam as a “religion of peace” and America’s left wing media launched into a “blame America and defend Islam” politically correct agenda that amazed even me. Not a single news outlet would place the blame for the attack where it belonged … Before the end of September, I had written and placed advertisements in major newspapers including the Washington Times, clearly showing that there was no difference between the Taliban of Afghanistan and our Saudi Arabian “allies”. In fact the Saudi princes had financed Bin-Laden and his terror cells. For my truthfulness I was ostracized in Washington for some time. I was “uninvited” to events, and individuals at the White House no longer returned my calls. But I fought on, not only in print, but on radio and TV as well, telling the truth about Islam and Saudi Arabia. While congressmen and Senators were inviting Islamic clergy to pray at official events I was pointing out that Bin-Laden was only doing his master’s bidding and his master was Mohammed. It took a year, but the truth prevailed! Slowly but surely newspapers and other media outlets began to listen to me. Former presidential candidate Gary Bauer joined the bandwagon of truth as did Franklin Graham. Soon even the major media could not ignore the truth. In August of this year a lawsuit for $1 trillion was filed by terror victims against the Kingdom of Saudi Arabia and many members of the Royal family. Documents filed by the lawyers of the 9-11 victims’ families show clearly that Saudi Arabia gave Osama Bin-Laden and the Taliban $300 million to attack targets other than Saudi Arabia. Further, the Saudis gave Bin-Laden and the Taliban hundreds of millions of dollars of other financial assistance and oil. Saudi Arabia and its royal families financed the Jihad attack against the United States by paying Osama Bin-Laden not to overthrow their corrupt regime. The tide of truth is rolling over the politically correct. Not even the National Education Association (NEA) can stop the truth. The NEA has presented a “blame America” curriculum to be taught by teachers this September. The NEA suggested that teachers point to the interment of Japanese citizens during World War II and other acts of American “intolerance.” The NEA’s official position is that “…no one group is to blame for 9-11.” The vast majority of America’s teachers have rejected the NEA “guidelines” and will tell the truth about what happened on 9-11 to their students. There is blame to every evil deed and there is plenty of blame to go around for what happened on 9-11. We can blame our politically correct leaders for refusing to follow up leads to terrorist activity for fear of being “insensitive” to Muslims. We can blame a press and educational system that equates the vile deeds of Mohammed with the peace of the Gospel of Jesus Christ. The real blame in America rests in the failure of our civil and religious leaders to understand Islam. Terrible things have been done in the name of Christianity over the years, but we always had the words of Christ to return to. Some good things have been done in the name of Islam over the years, but unfortunately, men such as Osama Bin-Laden can always go back to the words of Mohammed. The first massacre of Jews was conducted by him personally at Medina in the year 627. Yasser Arafat, in sending out his suicide bombers, is faithfully following Islam and the words of Mohammed. Arafat, Bin-Laden and Mohammed are one. The great “Fatah” (military conquest for Islam) is upon us. It is the fourth great expansion of Islam. If we fail to realize this and do not stop the conquest militarily as was done to end the first three great Fatahs, our children and grandchildren will live as slaves to Mohammed. What does the next year bring us, the next ten years? More violence against Christians by Islamic governments; more terror attacks in the name of Islamic Jihad; more Jewish and Christian children killed by suicide bombers and even more lies from Islamic leaders. Muslims have no fear of lying. In the Washington Times, Faiz Rehman of the American Muslim Council had the gall to claim last month that 16% of those killed on 9-11 were Muslims. He claims that 500 of the 3,000 killed were Islamic and that America has a debt to Islam. American newspapers have printed this lie without challenge. What is our defense? Truth rather than political correctness is our only defense. We need leaders who will tell the truth about Islam, tell the truth about Islamic nations, and tell the truth about the reality of Islam in America. We need leaders who are willing to take action against those who attack us and that includes those like the Saudis who finance the terror. Until then America will have no security and our families and descendants will be at risk. The third building fell by itself by inside explosions! USA is in trouble and needs to repent and return to the way it was before your mother stop prayer and Bible reading in schools in 1963. USA has only about 5 % of the worlds population, but 25% of all the prisoners in the world are inside American prisons. Something is terrible wrong in USA! Study what ILLUMINATI is doing in USA and in the world. And the Bohemian Grove in California. USA is the best and the worst country in the world at the same time!